Wednesday, April 2, 2014 - 15:15. Updated on Wednesday, April 2, 2014 - 18:04. A major earthquake that struck off the coast of northern Chile this afternoon has generated a significant tsunami with tsunami warnings issued for the Pacific coasts of South America. According to a tweet by The Weather Channel, a 6.3-foot tsunami has been reported at Pisagua, Chile, and a 5.6-foot tsunami at Isquique, Chile. The Pacific Tsunami Warning Center in Hawaii has issued an expanding regional tsunami warning and watch for parts of the Pacific located closer to the earthquake. An evaluation of the Pacific wide tsunami threat is underway and there is a possibility that Hawaii [and other Pacific Islands] could be elevated to a watch or warning status. 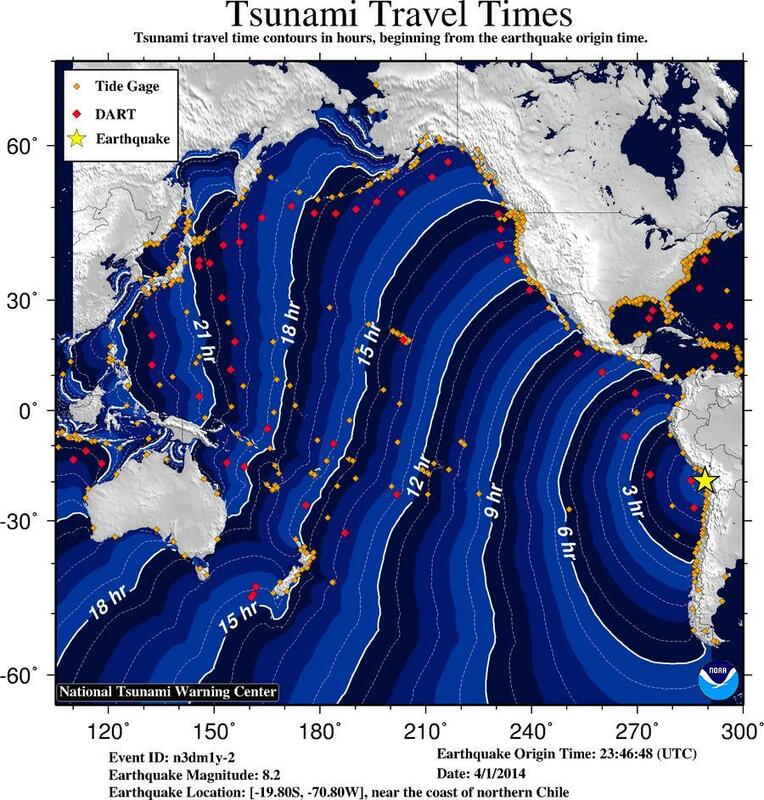 The PTWC stated that if tsunami waves impact Hawaii their estimated earliest arrival time is 0324 am HST Wednesday 02 April 2014 (Tonga time Thursday, April 3, 2014 at 2:25:00 am). The United States Geological Survey says the earthquake was a magnitude 8.2. The earthquake struck 61 miles northwest of Iquique, Chile at 23:46 UTC at a depth of 6.2 miles. According to the Associated Press, this area has been rattled by smaller quakes over the last two weeks. The Pacific Tsunami Warning Center in Hawaii has now determined that no tsunami threat exists for other coastal areas although some may experience small sea level changes. For all areas covered by this center the tsunami warning and watch are now cancelled (6:00pm Tonga time). ampl - tsunami amplitude measured relative to normal sea level. It is not crest-to-trough wave height. Values are given in both meters(m) and feet(ft) per - period of time in minutes(min) from one wave to the next. NOTE - DART measurements are from the deep ocean and they are generally much smaller than would be coastal measurements at similar locations. Based on all available data a major tsunami is not expected to strike the state of Hawaii. However, sea level changes and strong currents may occur along all coasts that could be a hazard to swimmers and boaters as well as to persons near the shore at beaches and in harbors and marinas. The threat may continue for several hours after the initial wave arrival.